A popliteal cyst, also known as a baker’s cyst is a swelling in the popliteal space - the space behind the knee - causing stiffness and knee pain. The pain typically worsens if the patient fully flexes or extends the knee, or when he/she is moving about. The condition, which has nothing to do with baking, is named after the British surgeon who first described it, Dr. William Morrant Baker (1838-1896). In most cases, people with a baker's cyst have existing knee joint problems, such as arthritis or a cartilage tear, which causes the knee to produce too much fluid, which may lead to a Baker's cyst. Most effective relief occurs when the likely underlying problem is treated. Sometimes surgery is needed to drain the cyst. Baker's cysts affect more women than men, probably because women are more likely to develop rheumatoid arthritis and osteoarthritis. Although people of any age may be affected, most patients are over 40 years of age. Usually, this condition is caused by a problem that affects the knee joint, such as arthritis or a cartilage injury. Treating the underlying cause can often alleviate the problem. 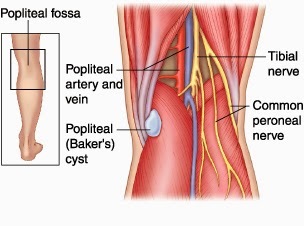 Though a popliteal cyst does not cause any log-term damage, it can be very uncomfortable. When to see a doctor - anybody who experiences pain and swelling behind the knee should see a doctor. A bulge behind the knee may be a sign of a more serious condition, such as an aneurysm or a tumor.